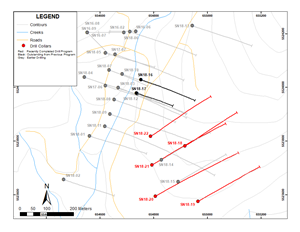 Westhaven Drills 12.90 Metres of 12.11 g/t Gold and 94.31 g/t Silver at Shovelnose | Energy and Gold Ltd.
VANCOUVER, British Columbia, Jan. 21, 2019 (GLOBE NEWSWIRE) — Westhaven Ventures Inc. (TSX-V:WHN) is pleased to report drill results from its recently completed drill campaign at its 15,542 hectare Shovelnose gold property, located within the prospective Spences Bridge Gold Belt (SBGB), which borders the Coquihalla Highway 30 kilometres south of Merritt, British Columbia. The program consisted of 5 holes totaling 2,183 metres of diamond drilling. Also included are assay results from two holes (SN18-16 & 17) drilled previously. Westhaven owns a 100%-interest in 4 properties covering over 35,000 hectares within the prospective SBGB, which is situated within a geological setting like those which host other significant epithermal gold-silver systems. It is close to major transportation routes and infrastructure allowing for cost-effective exploration. The SBGB is a 110-kilometre northwest-trending belt of intermediate to felsic volcanic rocks dominated by the Cretaceous Spences Bridge Group. Sable Resources and Westhaven have a combined control of 86% of the SBGB (225,000ha). Any ground staked by Sable within 5 kilometres of Westhaven’s existing projects is subject to a 2.5% NSR. In addition, Westhaven has a 30-day Right of First Refusal (ROFR) on any properties outside this 5-kilometre radius.